Cheese isn’t often the first food suggested when discussing senior nutrition. However, this food made from the pressed curds of milk actually has a few benefits that may be surprising. 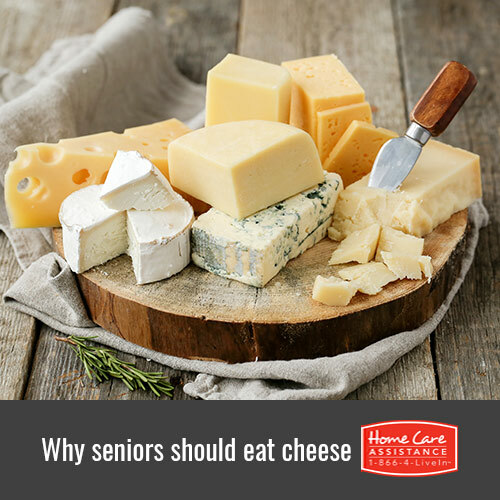 The staff at Home Care Assistance, a leading provider of elder care in Harrisburg, has put together a list of 4 advantages your elderly loved one can gain from eating cheese. Cheese contains a high level of compounds called menaquinones, a type of vitamin K that initiates the body to fight cancer cells. A study by researchers in Germany found including a steady amount of cheese in the diet reduced the risk of fatal cancers by 28 percent. One slice of cheese a day is often sufficient enough to receive this benefit. According to a study published in General Dentistry, eating cheese raises pH levels in the mouth, suggesting this food contains anticavity properties. The calcium content in cheese can also help prevent cavities and enhance enamel strength, which translates to fewer dental issues and greater tooth retention. Lactose intolerance can inhibit a senior’s ability to eat many other dairy products that can help the teeth stay healthy, but most cheeses contain a low amount of lactose. Osteoporosis is caused by a low calcium count in the body, but cheese contains a high amount of this mineral. The vitamin B found in cheese can help your loved one’s bones absorb this calcium so they remain healthy. Protein, which cheese also contains a large amount of, also helps repair bone loss. Cheese has a large amount of natural fats that can help your loved one gain weight if it was lost due to a recent illness. The minerals and vitamins found in cheese can also enhance your loved one’s metabolism, helping his or her body stay at a healthy weight. To learn more about senior nutrition, reach out to the elderly care experts at Home Care Assistance. Our part-time and live-in caregivers are expertly trained to help seniors with many aspects of daily living, and we also offer specialized Parkinson’s, post-stroke, and Alzheimer’s care for Harrisburg seniors who need more extensive assistance. For more information on our senior care services, call one of our experienced Care Managers at (717) 540-4663 today.